John Upton is a Senior Science Writer at Climate Central. He studied science and business in Australia, worked as a journalist in California, enjoyed an 18-month environmental reporting odyssey in India, then joined Climate Central's editorial team in New York. 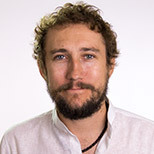 Upton has written for the New York Times, Slate, Nautilus, VICE, Grist, Pacific Standard, Modern Farmer, 7x7 San Francisco and Audubon magazine.